Whether Obama was duped, blackmailed, entrapped, bribed, coddled or threatened, he has supremely succeeded in climbing to what he probably thought was the top of the ladder…only to find it was up against the wrong wall! And then to find his ladder didn’t even go to the “top” — he has at least five layers of institutional power plus the secret societies telling him what to do. Instead of taking him to the heights of justice and respected leadership, or over the barricades of tyranny and deception to the fields of true freedom, Obama’s ascent has given him a vulture’s eye view of the broken-down, toxin-infested penthouse of fraud and violence that is our authoritarian and imperialist State. In the video below, listen to the difference in energy and enthusiasm, in eloquence and self-esteem. When he tries to defend his administration’s rampant surveillance he can barely find the words. 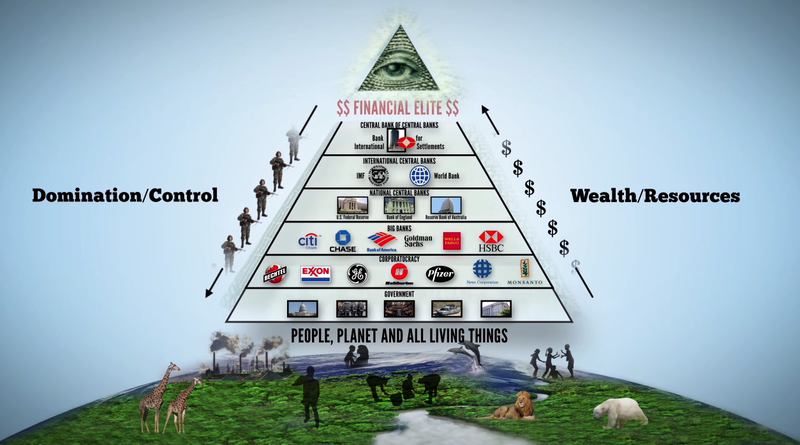 It is testimony to the true hierarchy of power depicted in the pyramid above. Whether we believe he would have changed things if he could have, or that he was in on this deal from the start, the facts remain the same. Obama is carrying out virtually the same agenda as the Bushes. He kept Gitmo open and continues torture. He’s expanded wars, authorized drones, legalized indefinite incarceration and assassination (NDAA). He condones comprehensive electronic surveillance, IRS bullying and the covert arming of drug cartels (Fast and Furious). He hired architects of the economic implosion — Summers and Geithner — to supposedly fix the damage they themselves helped orchestrate. He hired a top executive from Monsanto, Michael Taylor, to be his “food safety czar” and now Walmart cheerleader, Jason Furman, to be his Chief Economic Advisor. When Obama ran for President the first time, I remember the glowing vibrant hope voters had. And that hope is significant, because people believed they were actually voting for real change, for integrity, for freedom, for peace — and thought he might actually represent it. Instead, lies, theft and bullying are what they got. It was hard not to be touched by the glow in Obama’s own eyes when he got to speak of lofty, shared ideals as if he could and would stand for them. My hope comes not from another supposedly enlightened leader but from principle-based solutions coming from common sense, critical thinkers with nothing to hide. That’s who has always put humanity back on course toward liberty and justice for all.